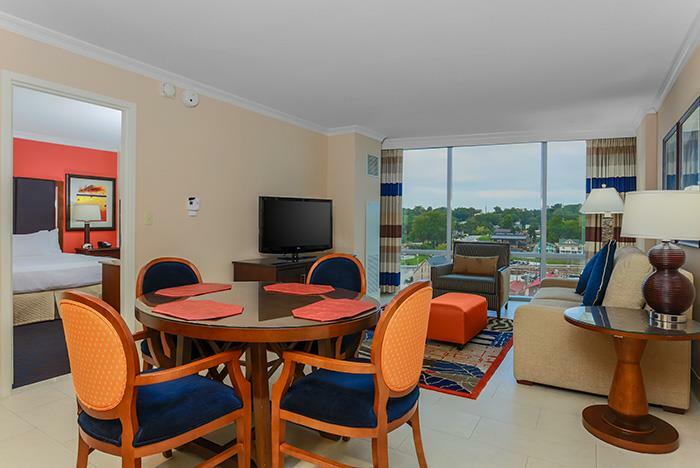 Situated in Branson Landing among more than 100 specialty shops, restaurants and other stores of interest, Hilton Promenade at Branson Landing offers comfortable rooms and suites any traveler can enjoy. 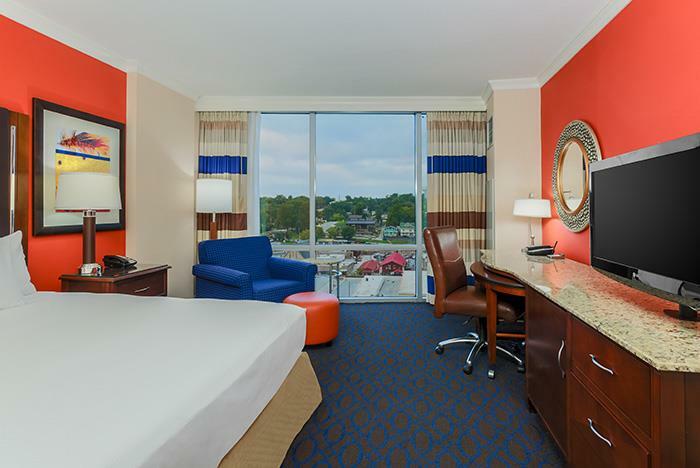 In-room features include a flat-screen TV, an easy chair, and a work desk, and on-site amenities include a fully equipped business center, meeting space, a pool, a fitness center, and much more. 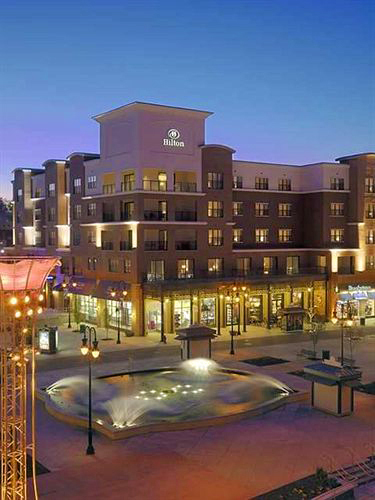 Hilton Promenade at Branson Landing is a business-friendly hotel located in Branson, close to Branson Landing, Branson Convention Center, and Veterans Memorial Museum. Additional points of interest include Dixie Stampede Dinner Theater and Cabaret Theater. Hilton Promenade at Branson Landing's restaurant serves breakfast, lunch, and dinner. Room service is available. 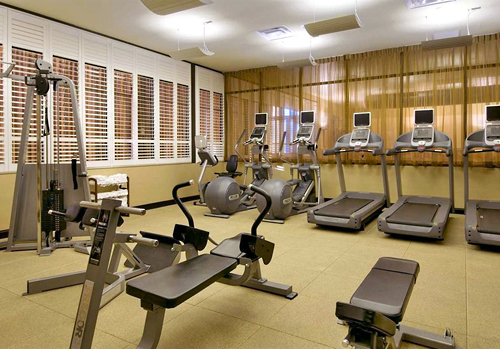 Recreational amenities include an indoor pool, a sauna, and a fitness facility. This 3.5-star property has a business center and offers small meeting rooms, limo/town car service, and audiovisual equipment. Complimentary wireless Internet access is available in public areas. 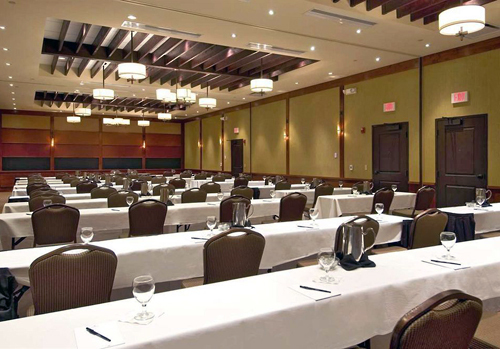 This Branson property has event space consisting of banquet facilities and conference/meeting rooms. 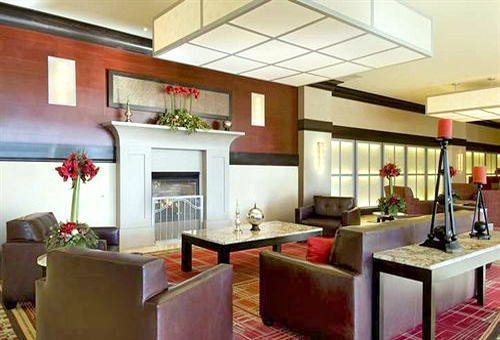 Additional property amenities include a marina, a coffee shop/café, and a concierge desk. The 242 air-conditioned guestrooms at Hilton Promenade at Branson Landing feature coffee/tea makers and complimentary weekday newspapers. Beds come with pillowtop mattresses, triple sheeting, and premium bedding. Bathrooms feature separate bathtubs and showers, complimentary toiletries, and hair dryers. Wireless Internet access is available for a surcharge. In addition to desks, guestrooms offer multi-line phones with voice mail. 32-inch flat-panel televisions have pay movies. Refrigerators in every room with limited supply microwaves available upon request. Blackout drapes/curtains, electronic check-out, and irons/ironing boards are also provided. Guests may request a turndown service and wake-up calls. Housekeeping is available daily. You must present a photo ID when checking in. Your credit card is charged at the time you book. Bed type and smoking preferences are not guaranteed. Your reservation is prepaid. The total charge includes all room charges and taxes, as well as fees for access and booking. Any incidental charges such as parking, phone calls, and room service will be handled directly between you and the property. Yes. The pet policy requires a $50 non-refundable deposit. Pets must not exceed 75 lbs. Yes. The restaurant serves a cooked-to-order breakfast, lunch, and dinner daily for an additional fee.